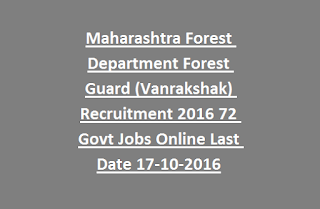 There are total 900 vacancies available in this latest recruitment of Maharashtra Forest Department. Other District vacancies are updating check back later..
For General candidates upper age limit is 25 years and lower age limit is 18 years. 5 years of age relaxation is applicable for the Reserved candidates. HSC or 12th pass in Mathematics or Science or Geography or Commerce or its equivalent from a recognized board or institute. Candidates have to pay this amount through SBI generated Challan at the time of online application and pay in nearest branch. Selection process will be in different stages Physical Efficiency Test and Physical standards test. Those who clear the preliminary running test, physical standards test and certificates verification based on merit in Running and educational qualifications 1:3 members of candidates are called for the long distance running test. Eligible candidates can submit their application forms online via the Maharashtra Forest recruitment website @mahapariksha.gov.in. Completed all the necessary information and upload the photo and signature images and finally submit the application form. Generate the fee payment challan and pay the fee on or before 02-02-2019. 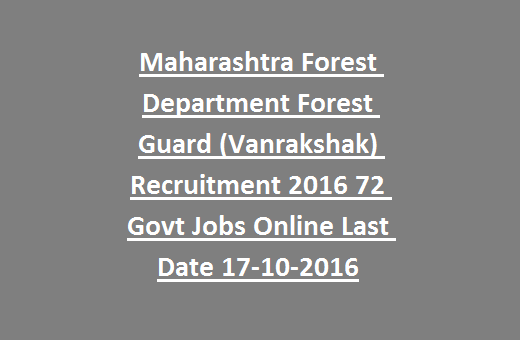 Chandrapur ForestGuard Recruitment Walking Test Date 09-01-2017 Click here for more information.